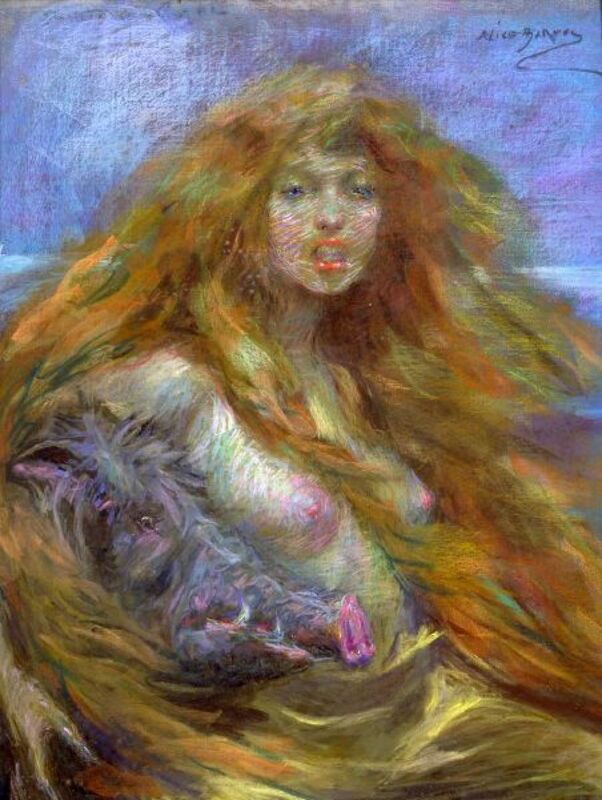 Alice Pike Barney (1857–1931), Circe (c 1915), further details not known. Wikimedia Commons. In his Metamorphoses, Ovid is retelling episodes from Virgil’s Aeneid, in which the hero Aeneas has reached the coast midway between Naples and Rome, at Caieta (Gaeta). There he went ashore, and two of the survivors of Ulysses’ crew meet to tell stories from Homer’s Odyssey. In the previous article, Achaemenides gave an account of Ulysses’ encounter with the Cyclops Polyphemus; next, Macareus tells his story of transformation by the sorceress Circe. Following Achaemenides’ account of the encounter with Polyphemus, he hands over narration to Macareus, who provides some details from later parts of the Odyssey. Macareus first tells of Aeolus, and the bag of winds which he gave to Ulysses/Odysseus. For nine days, Ulysses and his crew experienced favourable winds, but on the tenth day the crew opened the bag, in search of riches. They released the winds, which promptly blew the ship back to Aeolus. Then there were the cannibal Laestrygonians, who ate one of the three crew sent to meet them. Their chieftain led a party in pursuit of Ulysses, bombarding his ships with trees and rocks and sinking two of the three. That allowed just one ship, containing Ulysses, Macareus and others, to escape to safety. They then sailed to Circe’s island, where given their recent experiences the surviving crew refused to go beyond its beach. Lots were drawn to form a group to go to Circe’s palace, and they set off. On the way they came across enchanted animals, lions, bears and wolves, which rushed at them but did not attack. touched lightly the topmost hair upon our heads. began to bend and gaze with all my face. I now made tracks in sand of the palace court. (charms have such power!) I was prisoned in a stye. Only one, Eurylochus, had refused to drink and remained in human form instead of being transformed into a pig. He warned Ulysses, who came to Circe bearing a flower which he had been given by Mercury. Circe took Ulysses into her hall, where she tried to lure him to drink her concoction. He drew his sword, and forced her to back off. Circe and Ulysses then married, and she took him off to her bed. As a wedding gift to him, she transformed his crew back into human form, to their great relief and gratitude. Ulysses and his crew stayed on Circe’s island for a whole year before resuming their journey. Circe has been painted extensively since the Renaissance, right up to modern times, and a fair proportion of those works have shown the transformation of Ulysses’ men into pigs, and Ulysses’ meeting with Circe. Here is my selection of the best. Jan van Bijlert (c 1597/1598–1671), Ulysses and Circe (date not known), oil on panel, 51 x 81 cm, Private collection. Wikimedia Commons. Jan van Bijlert’s Ulysses and Circe from around 1640 shows the couple at the banquet, looking intently at one another. Circe holds her wand, and between them is the goblet containing her magic concoction. At the right, one of the serving maids looks directly at the viewer. At her heels are Ulysses’ crew, in the form of pigs. Salomon de Bray (1597–1664), Odysseus and Circe (1650-55), oil on canvas, 110 x 92 cm, Private collection. Wikimedia Commons. 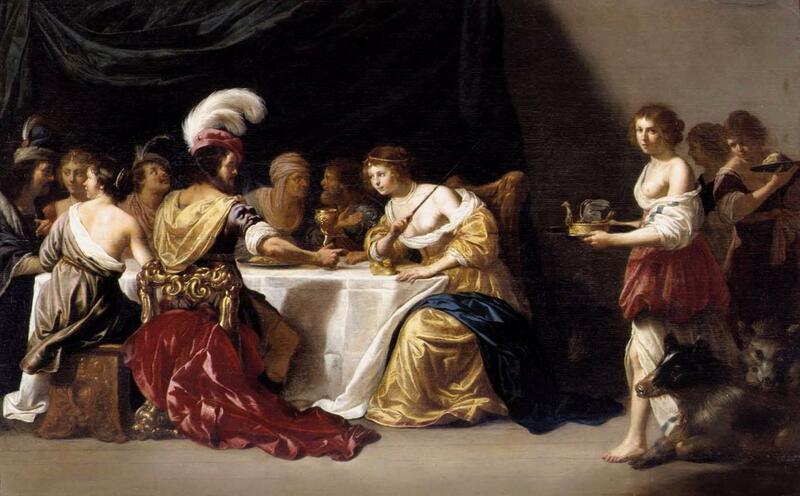 Salomon de Bray makes this a more intimate meeting, in his slightly later Odysseus and Circe (1650-55). 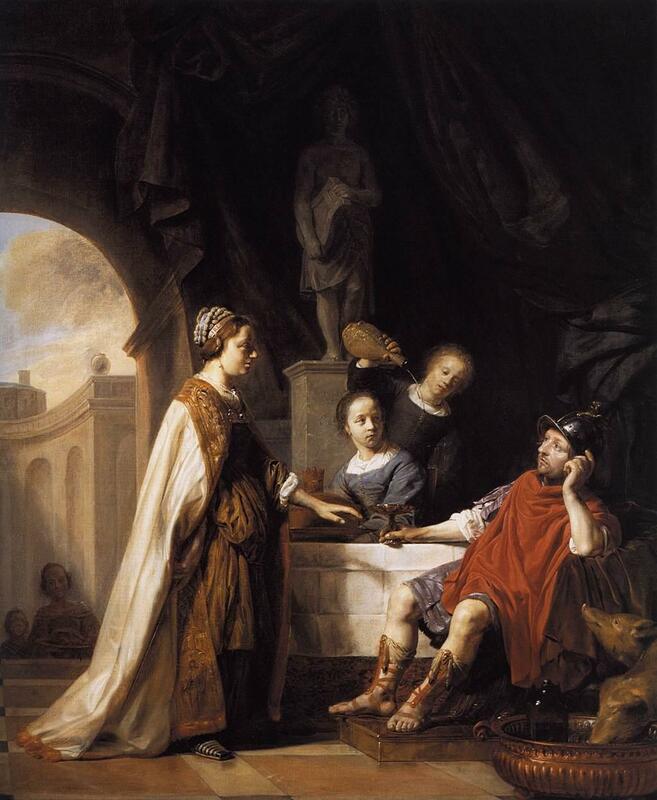 Here it is Ulysses who is seated, clutching a krater-like goblet into which a maid is pouring clear liquid from a bottle. The hero looks quite haggard, and decidedly unimpressed by Circe. Below Ulysses’ left arm, two pigs are drinking more of Circe’s concoction. Giovanni Andrea Sirani (1610–1670), Ulysses and Circe (c 1650-55), oil on canvas, 230 x 183 cm, Capitoline Museums, Rome. Wikimedia Commons. 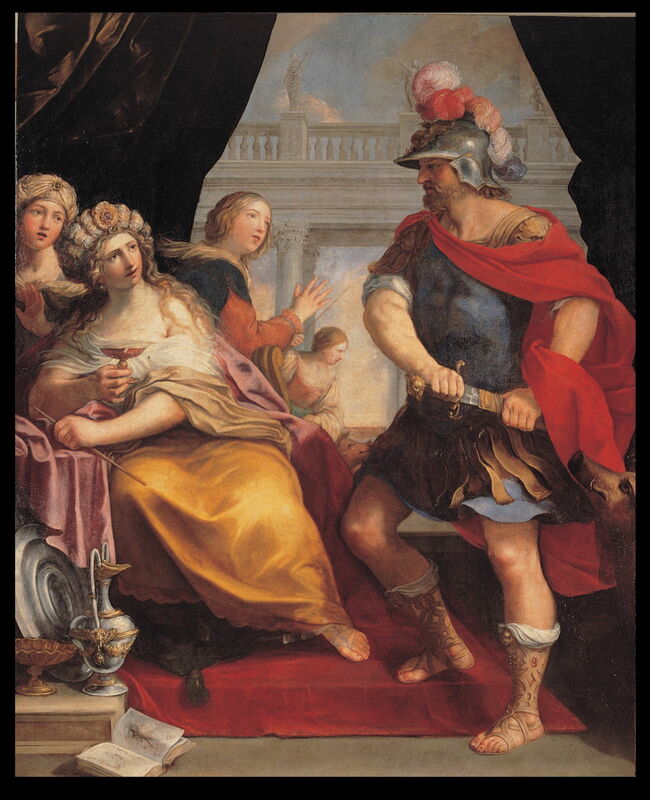 Giovanni Andrea Sirani, the father and teacher of the great Elisabetta Sirani, painted his account of Ulysses and Circe at about the same time as de Bray, and advances the story a few moments to the point where Ulysses is about to draw his sword. Here Circe is still holding the glass which she is trying to get him to drink from, with her wand in the other hand. The crew are seen in the background, in the form of pigs. Another woman holding a wand is with them: this could represent their transformation into pigs, or back into humans, which would form multiplex narrative. Matthijs Naiveu (1647–1726), Circe and Odysseus (1702), oil on canvas, 72.6 x 89.5 cm, location not known. Wikimedia Commons. 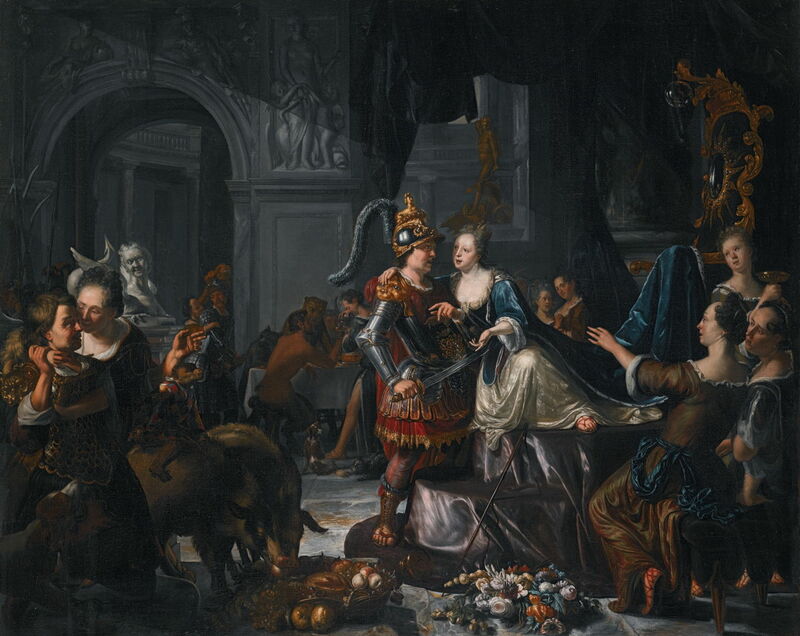 The last of the paintings from this period of popularity is Matthijs Naiveu’s Circe and Odysseus from 1702. This is set in a grand banquet inside Circe’s palace, with some peculiar clusters of figures which allude to Circe’s role as a sorceress. For example, there is a table just to the left of the couple at which a satyr and a demon are engaged in conversation. Circe has moved forward from her throne to embrace Ulysses, whose sword is pointing at her body to force her back. The goblet from which she has been trying to get him to drink is held by a maid at the far right. A couple of boars are feeding from fruit laid on the marble floor. The story then seems to have lost its popularity with painters, until the end of the nineteenth century. Although Gustave Moreau painted one work which shows Circe, it was John William Waterhouse who developed a sophisticated account. 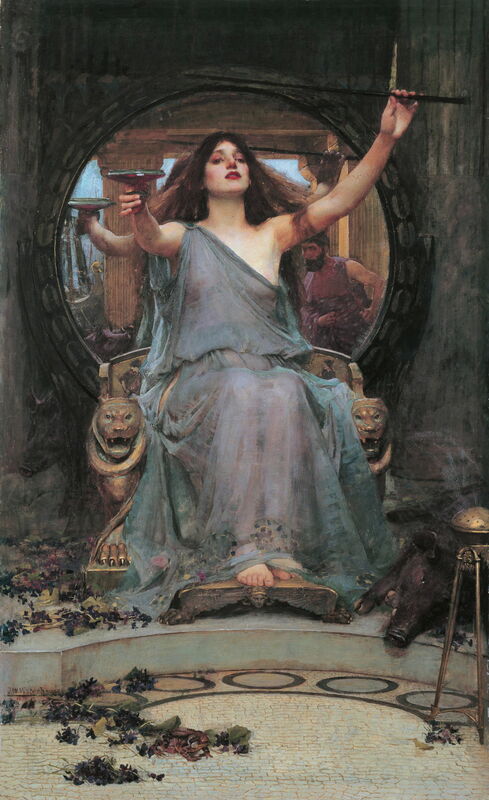 Waterhouse’s Circe Offering the Cup to Odysseus from 1891 is perhaps the most complex work showing this story. Circe sits on her throne, holding up the krater for Ulysses to drink, and her wand in the other hand. The viewer is Ulysses, seen in the large circular mirror behind the sorceress, preparing to draw his sword. On the left side of the mirror is Ulysses’ ship, and scattered on the ground at Circe’s feet are the herbs and berries which she used to prepare the concoction with which she transformed the crew. To the right, one of those pigs lies on the ground, behind a small incense burner. Waterhouse has not only told the story using the ingenious confluence of objects, but encourages the viewer to consider their role in his painting, and more profoundly about the action of looking, and the image. Briton Rivière (1840-1920), Circe and her Swine (before 1896), further details not known. Wikimedia Commons. 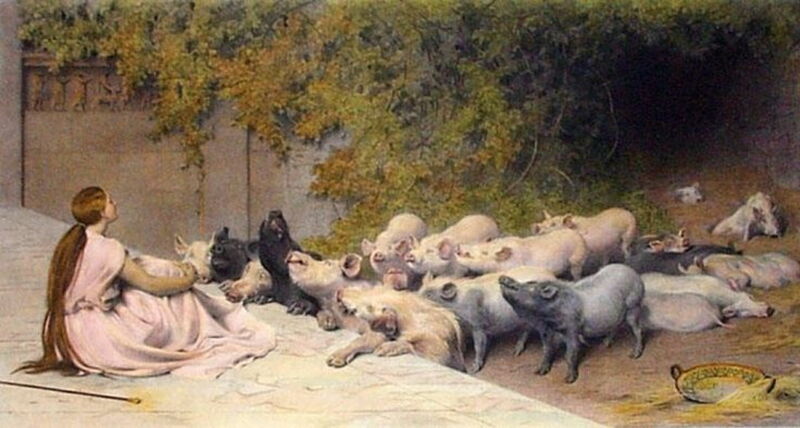 Briton Rivière’s rather simpler painting of Circe and her Swine (before 1896) has been used as an illustration for several versions of the Odyssey, and unusually casts Circe as a magic swineherd, her wand resting behind her. Finally, Alice Pike Barney’s very painterly portrait of Circe from about 1915 was most probably made in pastels. Her streaming golden hair almost fills the painting, and wraps the head of a large boar which she is embracing. I apologise for the poor image quality here, which is the best that I have been able to locate. Although not apparently tackled by many of the Masters of narrative painting, this fascinating myth from the Odyssey has been well-told, and Waterhouse’s account stands out as a major work of the nineteenth century. Posted in General, Language, Life, Painting and tagged Barney, de Bray, Metamorphoses, myth, Naiveu, narrative, Ovid, painting, Rivière, Sirani, van Bijlert, Waterhouse. Bookmark the permalink.